Ruby Hunter Video Slot has their own “Lara Craft” female Ruby Hunter who takes along her four assistants in their quest to find some precious gems. Hidden in a mine deep in the jungle you will encounter Free Spins, Jackpot Symbol Re-spins and three personal Progressive Jackpots. This unique Slot offers play over 6 reels and 3,600 ways to win. Pays are awarded for adjacent symbols from left to right only. The ruby mine can be seen in the background of the elaborate game window with frameless reels. Spider webs, skulls and snakes adorn the stone frame with some heroic soundtrack crescendos to keep the blood pumping. The wild symbol is a tribal mask substituting for all symbols other than the scatters and jackpot symbols. Scatters are an entrance to an ancient temple, while a red ruby is the jackpot symbol. 1. A Hyper Bonus Buy feature. This feature has become popular and included in a number of slots to date. There are four options available, each with an increasing amount of free spins and Cost. 2. Free Spins Feature. To trigger the feature you need three to six Bonus Symbols which will activate 8 to 20 free spins. This feature can be re-triggered. The main attraction in the free spins is the jackpot re-spin feature where you are playing to win one of the three progressive jackpots. 3. Three progressive jackpots – Silver, Gold and Platinum are displayed in the top right corner of the game window. These are personalized jackpots specific for each player and each casino account with the balances stored when the game is closed. The jackpots can only be won in the free spins feature with a minimum of three jackpot symbols. Jackpot Symbols trigger a re-spin with the triggering symbols locked for a chance to land more. Any further symbols appearing on the re-spin will also lock in place and a further re-spin is is given. This continues until no new jackpot symbols land of a re-spin. If this Slot is of interest to you, it has just become available at Slotsmillion. As a recommended Online Casino we invite your to Read our Review. Thereafter please feel free to visit the Casino by clicking on the Banner below. 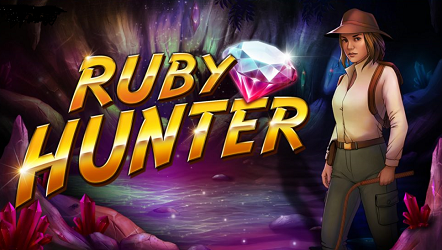 This entry was posted in Casino Games and tagged Play Ruby Hunter at Slotsmillion for Free or for real money, Ruby Hunter Sot Review at http://www.southafricanonlinecasinos.com on March 18, 2019 by Casino Admin.